This program will also develop your research literacy and skills, enhancing your ability to respond effectively to the changing nature of professional knowledge and practice, and ensuring you have the skills to provide quality services throughout your professional life. Communication and swallowing is a fundamental part of human life, and difficulties can have enormous ramifications. Studying speech pathology at Griffith, you’ll learn to diagnose, develop strategies and treat people of all ages in a range of different contexts. Our degree is extremely hands-on, designed to provide the comprehensive education you’ll need to work as an effective, empathetic speech pathologist in Australia and other countries. Clinical placements are instrumental and commence from the start of the degree – so you develop your professional identity and apply what you’re learning at university to the clinical setting. At Griffith we collaborate with a wide range of service providers in South-East Queensland and Northern New South Wales to ensure our students receive the best clinical placement opportunities. These are through our partnerships with a broad range of government and non-government agencies across health, education, disability, and aged care. We also conduct on-site internal speech pathology clinics in the Griffith Health Centre on our Gold Coast campus. The Master of Speech Pathology program is accredited by Speech Pathology Australia. 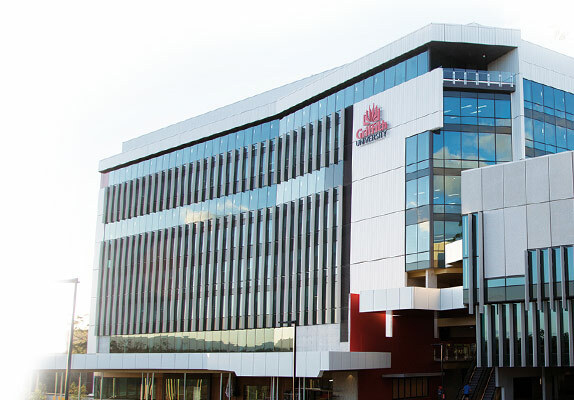 The $150 million Griffith Health Centre on our Gold Coast campus operates over the road from the 750-bed Gold Coast University Hospital and a 250-bed private hospital. It's a unique environment in which to gain unrivalled clinical experiences. Our industry-leading research in many areas of medical science informs our degree content, helping to produce forward-thinking graduates ready to make their mark in a healthcare career. “These positions are highly competitive and much sought after by graduating students from all speech pathology programs,” said discipline lead, Professor Elizabeth Cardell. You'll be eligible to apply for membership of Speech Pathology Australia and work as a fully accredited speech pathologist. Career paths are also available in academia, research and management.